Nobody cares. If this primary season has taught us anything, it’s that almost no one really cares. Time and again, we have borne witness to the truth being sacrificed for the greater good of liberalism and a “bi-partisan” agenda as defined by MoveOn.org, Hillary Clinton, and The New York Times. We have been shown – in the starkest, most frightening detail – what this leftist agenda holds in store for us and our nation, and no one cares. A cabal of left-leaning journalists, Democrat politicians, and a growing number of alleged “Republicans,” are trying to sweep conservatism into the dust-bin of history, and no one cares. Well, almost no one. Conservative talk radio hosts like Rush Limbaugh, Sean Hannity, and Mark Levin, have been desperately trying to sound the alarm, and for their trouble, they have been smeared, misquoted, and demonized by not only the usual suspects in the liberal media, but by surrogates for Republican presidential candidates John McCain and Mike Huckabee. What crime have Limbaugh, Hannity, and Levin committed? They told the truth. In the best interest of their nation and conservative values, they simply told the truth. They pointed out in minute, unvarnished detail, that McCain and Huckabee may be many things, but true conservatives they are not. They stressed, that if conservatives wanted to vote for someone who would uphold their ideals, they may want to look elsewhere. They wondered, why liberal paper after liberal paper was endorsing John McCain? They stood on their principles, and for that, they have been vilified. Ignorance and fabrication have long been the currency of the left, and their deceitful and ad hominem attacks against the Limbaughs, Hannitys, and talk radio, only reinforce that their treasury is bursting at the seams. While reprehensible, such conduct is to be expected. What is not expected, and what can’t be accepted, is self-described “Republicans” casting the truth aside to recite the talking points of the left. In listening to Limbaugh the other day, I was alerted to a column by former George W. Bush speechwriter Mike Gerson, that ran in the John McCain supporting Washington Post. In the body of the pro-McCain column, Gerson made some assertions that are flat out wrong. Gerson said, “…by the summer of 2007, the Republican presidential candidate most closely identified with the war, John McCain, was in serious trouble.” Gerson painstaking painted the picture that McCain fell out of favor with Republicans and conservatives because he was supporting an unpopular surge. Nothing could be further from the truth. Conservatives overwhelming supported the surge. McCain was in “serious trouble” in the summer of 2007 with conservatives and Republicans, because of his partnership with Ted Kennedy to support amnesty for illegal aliens. Gerson knows that, but such facts detract from the rewriting of McCain history now taking place across the communications spectrum. 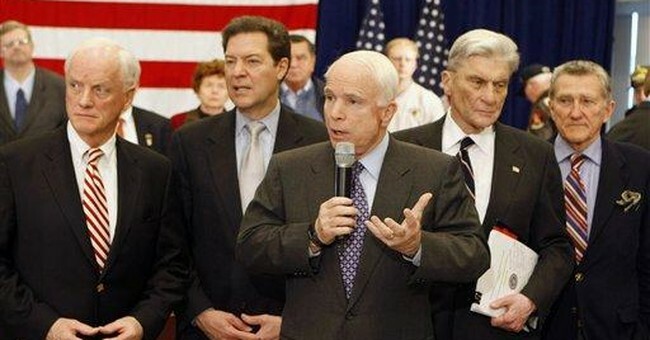 Boston Globe, Concord Monitor, and the amnesty-favoring Boston Herald, all endorsed McCain. The Concord Monitor then took the unprecedented step of smearing Romney in an “un-endorsement” editorial. John McCain is a good and decent man. He is a decorated patriot who only has the best interests of our nation at heart. Those who say otherwise, do not know the man. That said, he is not – as all of his ads now proclaim – a “True Conservative.” He is not a “Ronald Reagan” conservative. He is a moderate at best, and he has every right to be a moderate. Blue or otherwise. Senator McCain has the right to his opinions and beliefs. He paid a steep price in the defense of liberty and must be afforded every courtesy. He warmly and articulately stated some of those beliefs before the CPAC convention last week. Remarks that were generally well received by an anxious and curious audience. However, thanks to the constitution Senator McCain put himself in harms way to protect, conservatives and talk show hosts also have a right to their opinions and beliefs. Many openly wonder what effect a McCain general election candidacy or presidency would have on the conservative movement. That is their right. They are not the enemies of John McCain nor the GOP. They seek nothing more than the truth. In the stampede of some “Republicans” to curry favor with the presumptive nominee, they must not subvert the truth for access. For if they do, such actions will prove that the left has won, the nation will be ruled by one ideology, and that basically no one cares. No one that is, but talk show hosts going the way of the dinosaur.